Our goal is not to push products, but promote proven solutions backed by building science and years of real-world, practical experience. 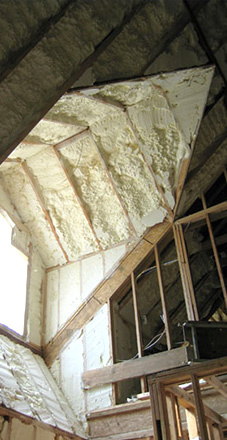 FoamIt is an insulation company founded firmly on sound building science and thermal boundary properties that are time-tested and proven to be effective. We combine this with decades of experience to create solutions that fix our customer's problems the right way. Our fanatical allegiance to building science has become so ingrained in our culture that we call our sales people Building Consultants – because, first and foremost, that is what they are. Before we sell products, we identify problems. We believe that the first step in an effective strategy to achieve energy efficiency, health and comfort in any new or existing structure is to first identify the basic scientific laws and principles that hinder us from achieving these results. When we identify these accurately, we can begin to develop effective solutions utilizing the right products and services for the situation. In addition, this approach frees us to recommend the products/services that make the most sense and not just the ones that we happen to sell. Typical contractors offer a limited number of products and therefore a limited number of solutions – which they will likely try to sell you regardless of how effectively they will meet your needs and solve your problem. Not FoamIt. We offer knowledge first, and the right solutions second. The knowledge we offer only has value in as much as it is accurate and true. Our commitment to building science and proven performance requires that we offer only products and services that provide the greatest benefit as determined by thoughtful and thorough building science scrutiny and real-world experience. The result is a body of products and services that are wholly in sync with the most sound and reliable building science principles and proven best practices. And we only offer the solutions that you need – no more and no less.